The BMW X5 driven by a 25-year-old Russian national was subjected to inspection when it arrived at the checkpoint from Russia at 1:57 a.m. on Saturday. 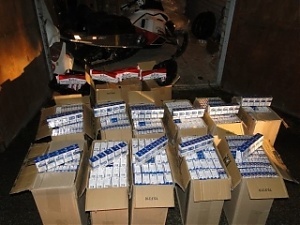 An inspection of the vehicle revealed 48,860 cigarettes in boxes bearing Belarus tax stamps hidden within the chassis of the vehicle. In addition an electric shock weapon was discovered in the vehicle, spokespeople for the South prefecture of the Police and Border Guard Board told BNS - writes baltic-course.com.